Discover this classical tour route, which includes visits to Guilin and Yangshuo. This private tour is a tour of the major highlights of the area, a focus on 'old towns' and famous landmarks within the region. 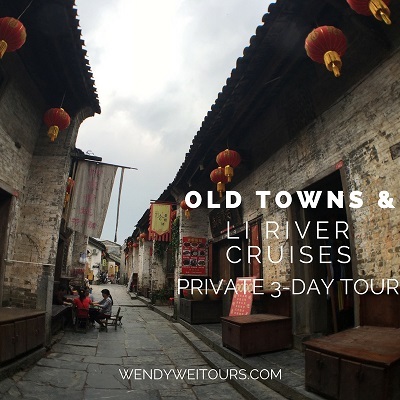 The Old Towns and Li River Cruises tour is held over three days and two nights with your own experienced Wendy Wei Tours local guide. Visitors stay the entire duration of the tour in Yangshuo. Meet your tour guide in the morning and travel to the Zhujiang Pier to board your Li River Cruise boat. We have proposed the 4-star Boat with Upper Deck Reserved Seating, allowing you the best views along the River. 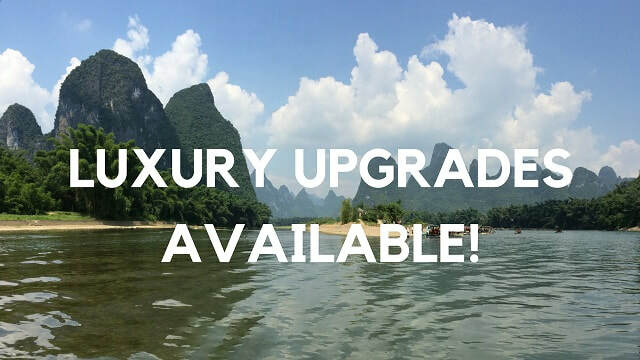 During the cruise, which lasts approximately 3 x hours (depending upon waterflow) and is along an 83 kilometre section of the river, visitors will see incredible scenery with large karst mountains either side of the river among beautiful rural scenery. Upon arriving at Xingping, disembark the boat and walk along this busy street. In the afternoon, explore the Yulong Valley and Yulong River with its scenic beauty by vehicle, bicycle or walking, depending upon preferences. There are a number of different local villages, rural scenery and karst formations throughout this area and it’s a peaceful and scenic way to spend an afternoon. During the evening you will return to West Street for dinner before watching the famous Impression 3rd Sister Liu Show held on the banks of the Li River during the evening. You will return to your hotel in Yangshuo at approximately 9:30 pm at the conclusion of the show. On the morning of Day 2, travel to Huangyao Ancient Town which is located approximately 1.5 hours south of Yangshuo near the town of Hezhou. Huangyao is a large, historic town and has been largely preserved allowing visitors to imagine how life here was in the past. Usually an entire morning is spent at Huangyao covering the different areas of the old town. During the afternoon, return to Yangshuo and board your own private raft to drift and be slowly paddled along the Yulong River. Finish the afternoon off with a massage and enjoy the evening at leisure. Begin the day with either a Cooking Class (which takes and entire morning) or alternatively explore some of the nearby sights by climbing the hills of either Xianggong Hill or Cuiping Hill. You will also have time to visit a local rural market day (subject to specific date). These rural market days are held on specific dates each month and they’re a good place to have a quick stopover to experience traditional Chinese markets (how all markets used to be!) and rural life nowadays for farmer’s living in the Yangshuo countryside. In the afternoon, depart Yangshuo and visit Reed Flute Cave, which is one of the most famous attractions in Guilin City before either being transferred to the airport or to your Guilin Hotel to conclude the tour.